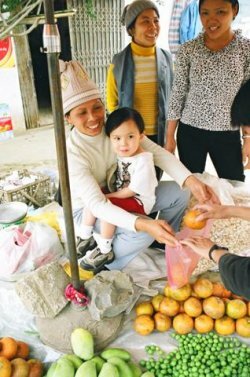 Adoptive family visits Lang Son, Vietnam, where their child was adopted. We landed at Noi Bai airport and I had to fight to hold back the tears. I was choked up. . .it was my baby's first trip back to Viet Nam. During the nine hours that it took us to fly from Osaka, Japan, to Hanoi, Viet Nam, Bao and I had talked about all the things that I love about Viet Nam and Bao debated (with himself) whether Scooby Doo books could be found there. His prior research on Scooby Doo books in Japan had resulted in some disappointing results. Fortunately, the exciting adventures of Anpanman, Shokupanman, and Melonpannachan had sidetracked him from his original quest. Not more than five minutes after being on the road from the airport to our hotel, Bao excitedly yells, "there's Bao!" Sure enough "Bao Viet" and other signs line the highway and we quickly start a game of who can find the next "Bao" sign. After spotting a dozen "Bao's" with more to come, my son makes a comment that brings me on the verge of tears AGAIN. "There are Bao's EVERYWHERE. 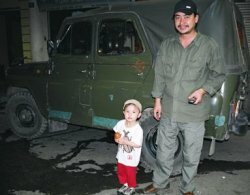 Mommy, I like Viet Nam." My heart sings. I could tell already that our short time in Viet Nam was going to be special. The hotel staff remained the same as two years ago and gave us the royal welcome. Bao tried out some of his newly acquired Japanese. "Konnichiwa!" he said to the hotel staff. I smiled. . .he tried out his limited Spanish in Japan, so this attempt to communicate in Japanese seemed appropriate. Our room had two small balconies overlooking the Hanoi Old Quarter. I felt like things couldn't get much better. We called new friends (hi Binh-Minh!) and went out to dinner at Brother's Café. The restaurant was as beautiful as I had remembered and made all the better being there with my son. At 5:00 a.m. the next morning, Bao and I swung our balcony doors open to watch the street life awaken. 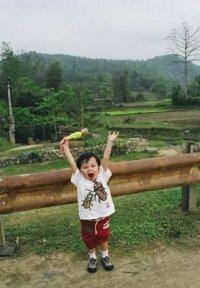 In a few hours we were headed to Northeast Viet Nam, specifically Lang Son, to visit the orphanage where he had stayed for a few months, as well as his Vietnamese family. If I couldn't get through our drive from the airport to Hanoi without my eyes brimming, I was in trouble on this leg of our journey. 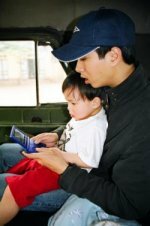 We had hired a driver and a translator/guide and we were especially lucky to get a Jeep (an old heavy duty army-style one) and, I'm convinced, one of the most talented drivers in all of Viet Nam. Bao, Ha (guide), and Kien (driver) hit it off immediately. Kien let Bao take a seat in the driver's spot before leaving the hotel and that's all it took for Bao to be completely excited about our trip. I couldn't look away from the incredible scenery, while Bao and Ha took turns on Bao's Gameboy. It was going to be a long six hour drive, so I didn't discourage the diversion. They laughed and laughed as Bao tried to tell Ha, in English of course, all the things he needed to do to get to the next level. Ha didn't understand everything Bao was telling him, but Bao didn't tire of telling him over and over and over again. They were instant pals. The trip to Lang Son was incredible. After six hours of the bounciest ride ever, we stopped for lunch in a small restaurant in the countryside. Bao ate an entire fish (a huge one that Ha deftly removed all the bones for Bao), at least 12 small spring rolls, and a fresh orange that we bought at the market. The ladies in the market swooned over Bao and held him as I picked out some fresh fruit to give as gifts. To my surprise, he didn't mind that these women wanted to hold him, pinch his cheeks, and tell him repeatedly how handsome he was. Bao began to act silly and that only added to his appeal with these ladies. He made crazy faces, tried his classic Japanese pose by holding his fingers in the peace sign, and hammed it up as I took photos and this cracked everyone up. My little comedian loves being in the spotlight, so he was in all his glory. The scent of anise drying in the streets of Van Quan was extra special. Our driver stopped to buy at least 10 pounds of the important pho ingredient, almost in disbelief in the volume of spice freshly drying along every turn in the road. He and our guide also picked up huge jars of pickled bamboo shoots with chiles. It seemed like our guides were just as excited to be in Lang Son as we were. . .looking out for their next special food purchase! The rest of our trip was amazing. Back in Hanoi, we visited a couple book stores near Hoan Kiem Lake, scoured the shelves for Scooby Doo, settled for a few other books and CD's, stopped for ice cream and happily wandered. Bao met up with his two new girlfriends (all three of them are 3 years old going on 4) for play time in the afternoon and we decided to wander more after dinner. We ran into a hilarious Canadian-French guy at an antiques store who accidentally had his head shaven by a local barber. He was trying on hats when he mentions that his family has extra tickets to the next Water Puppet Theatre performance at Thang Long. Would Bao and I like to go? Bao had seen photos of the water puppets, and he sat on the edge of his seat during the performance. He asked me questions all night about the workings of those puppets, but most I couldn't answer. He said, "What was your favorite part?" I said the dragons. He responded "my favorite part was the dragons AND the singing." I told him we would look for a book at the airport the next morning. Low and behold, the small book shop in the International departure section of the airport had a book on water puppets. . .IN GERMAN. Bao carried it on the plane and through our last days in back in Japan. Thinking that we'd have to wait for our next visit to Viet Nam to get answers to Bao's water puppet questions, I had completely forgotten that my dad reads German. Grandpa was going to be Bao's hero. I could go on forever about our trip, but these were some of the not- too-private highlights! If only we could have stayed longer. . .